This first day of fall was cool and clear. A half moon was still visible in the full blue sky. The drive up to the tip of the Bruce Peninsula was quick on an empty Highway 6. Standing in the wind facing the loading dock one can’t help being impressed watching this craft come in. Even before it settles into its mooring, the bow opens like some giant sperm whale about to devour krill, raising up almost to the bridge to reveal its vehicle deck. As soon as it come to a stop it spews out vehicle after vehicle, two-wheel, four wheel, eighteen wheel. Talk about a carbon footprint. 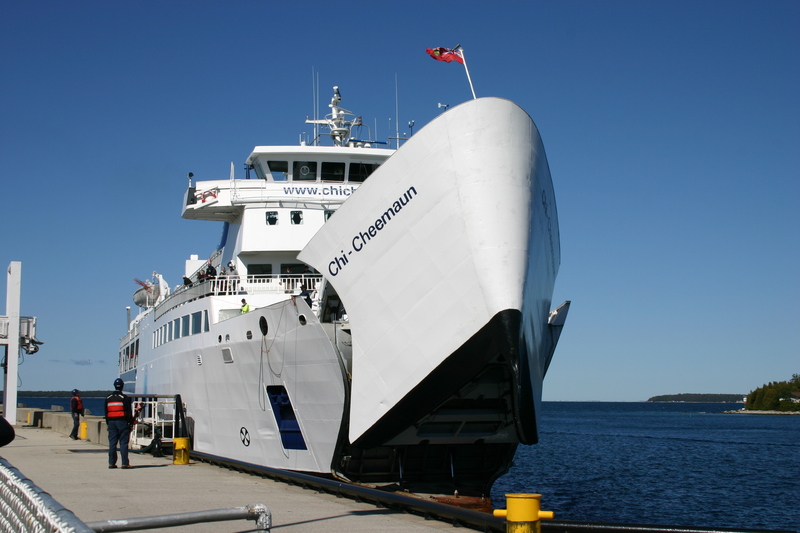 It empties and reloads in less than 30 minutes then sets sail again. We climb to the top deck and a magnificent view. The cold wind and whitecaps are more pronounced but the ship is steady. On one side of us is the vast expanse of Lake Huron stretching to the horizon, sparking in the sun. 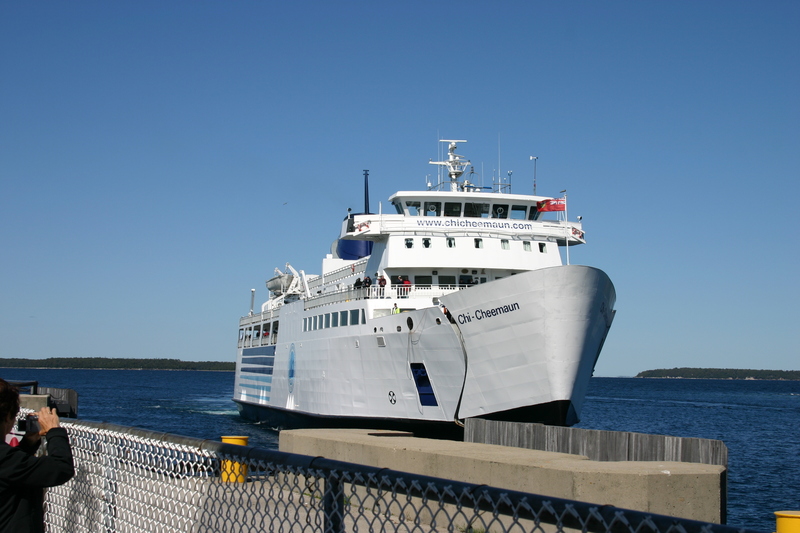 On the other, the islands of Georgian Bay dot the waterscape. It gives you a safe feeling knowing land is close by. Without clouds to hold back its heat, the sun beats down reflecting off the steel deck. There is warmth in the air behind the stacks in the stern and people stretch out and doze off on the benches. There is still a bit of wind though and those in shorts and sandals take refuge inside. Those of us who stay will be well wind-burned and sunburned in no time. After two hours we dock and drive out of the belly of the boat into a packed dock. Vehicles for the return trip are lined up and waiting. This is a busy ferry. The conjestion of cars forbids us to dally. We will have been driving and sailing for seven hours by the time we reach Espanola. That’s as far as we’re going today. The sun rises above the Domtar stacks – 5 of them – spewing white smoke and steam into the skies over the small town of Espanola. All night long, you hear this white-noise drone and when you realize it is the sound of the stack blowing their residue 24/7 you just shake your head. Sleep was fitful because of this and the sound or 18-wheelers loaded with lumber, rolling up and down Highway 6. 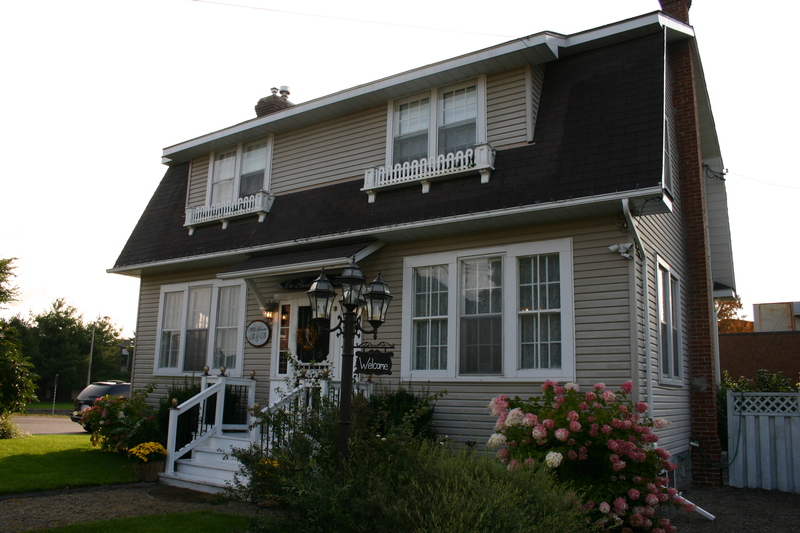 The Mill House B&B (millhousebedandbreakfast@bellnet.ca) is on Sheppard Street just off the highway but not far enough off to dull down the noise. ‘Jewel’ is the innkeeper. Her husband has worked at ‘the Mill’ for over 30 years. Her two boys work there in the summer. Most everybody in town works at “the Mill.” Another example of a one-industry town living under the fear that if Domtar’s market share fails and their stock goes down – layoffs sit on the horizon. Interesting thing is ‘The Mill’ has been around for 104 years. Espanola has only been incorporated as a town for 50 years. From 1943 to 1946 Espanola was home to German Prisoner of War Camp #21. The captured soldiers built the road from Espanola to Manitoulin Island. They even tried to build an escape tunnel. But, they were caught in the act. We are in the Mercedes room – the only one with an en suite. It is quaintly decorated with a canopy bed – wicker chairs – lots of old photos in antiques frames on loan from the town museum. There are ‘historical’ knick-knacks all over the place. It is a comfortable room – charming is how N. describes it. But, it is not quiet. Nonetheless, the sound of smooth jazz filters up the staircase. As we come down to breakfast I noticed the speakers hidden behind an antique hutch. In the parlor, a fire (gas) burned in the white painted brick fireplace. The ambiance gives you a cozy feeling. In the dining room the old oak table featured two full place settings, a full coffee pot, sunflowers in a vase, two glasses of juice and on the white dinner ware two orange yogurt parfaits and a flowery card with a hand written message wishing us a “great day.” This wasn’t your typical ‘serve yourself’ B&B breakfast. ‘Jewel’ appeared and served us each a Brie Omelet dusted with shaved almonds, sausage wontons and toasted 7-grain bread. She followed with fresh baked scones and homemade strawberry preserves. All of this was included in the price of the room – $90.00 for the two of us. 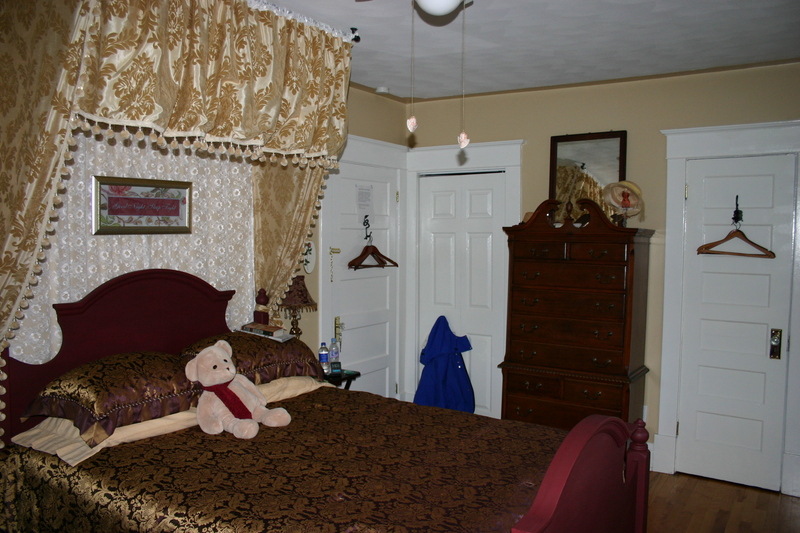 If you ever have to spend a night in Espanola I highly recommend you stay at The Mill Bed and Breakfast. Out of Espanola you pick up The Trans Canada to Highway 69. 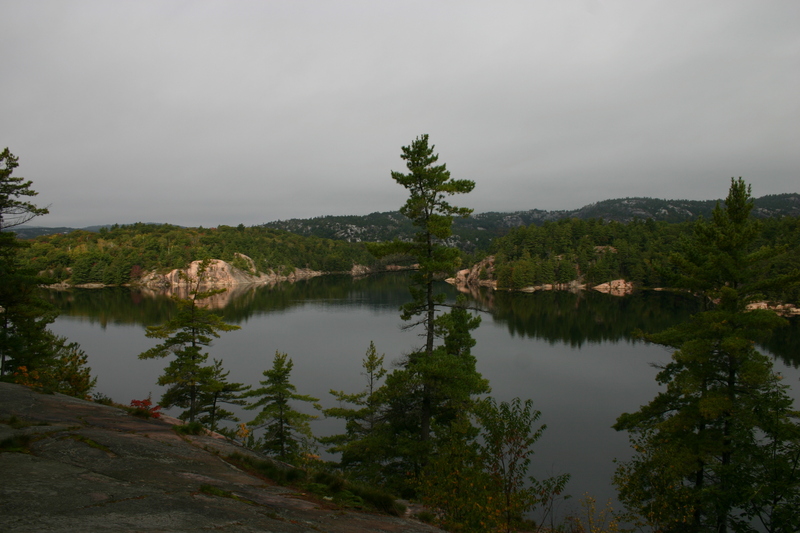 Drive for a couple of hours then turn down Secondary Highway 637 for a 63 km drive through the fall foliage and granite outcrops to the North Shore of Georgian Bay, past Killarney Provincial park, to Killarney Mountain Lodge. Originally it was a wilderness hideaway for the Fruehauf family. They make 18-wheelers. They used it as a corporate retreat until the IRS in the U.S. got suspicious. The Feds wondered how the company could write the place off as a manufacturing center when there was no road in and the only way you could get there was by water or air. True. Until 1962 there was no direct road in to the small fishing town of Killarney. 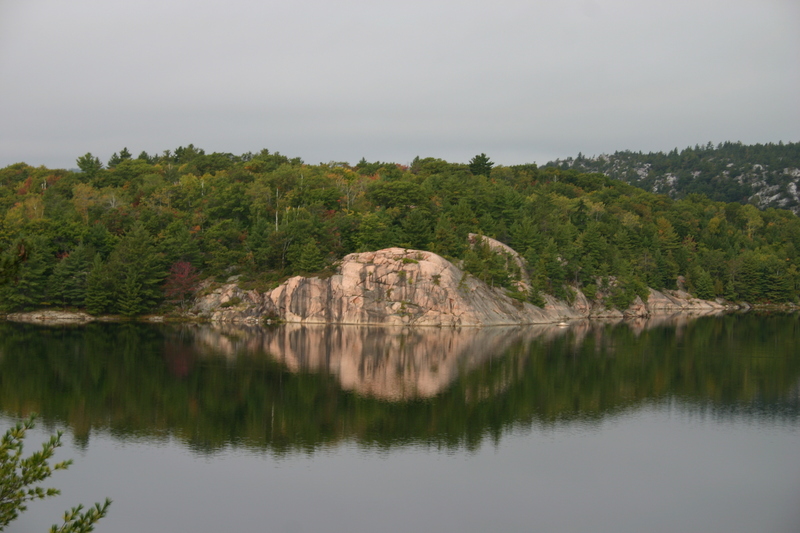 It was founded – way back – as a fur trading post by the Voyageurs. The town survived on its isolation and independence. Today it is still small with a population of 250. The grade school only has 9 students. A lengthy inlet provides safe harbour for all manner of crafts, but it appears that there is only one active fishing boat these days. The lodge is rustic (read old). It will soon need renovation. Still it sits on a landscape of spectacular vistas of rock, water and sky. They say it is “the quintessential Canadian experience on Georgian bay,” and they are right. We walked through the tiny village. The harbour docks are the main street. A older woman in an SUV was coming out of a small store with a painful look on her face. She was looking for vinegar. She was putting something down for the winter and had run out. Seems there wasn’t a bottle anywhere in town. The only place she could get what she needed was in Sudbury – two hours away – a four hour round trip. That’s what happens in small towns. Killarney inflates with tourists and boaters in the summer. Right now is is quiet. Silent. Absolutely no traffic sound. Just the sound of water, wind, the call of migrating geese and the odd boat moving up the inlet. I thought Southampton was peaceful. Killarney outclasses it for quietude. 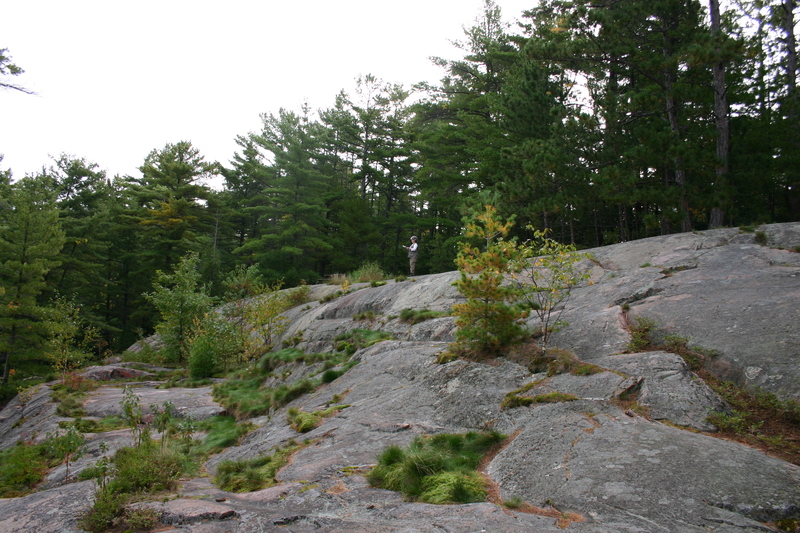 Next day we climbed the Park’s Granite Ridge Trail. It took us up steep, exposed granite rock faces. 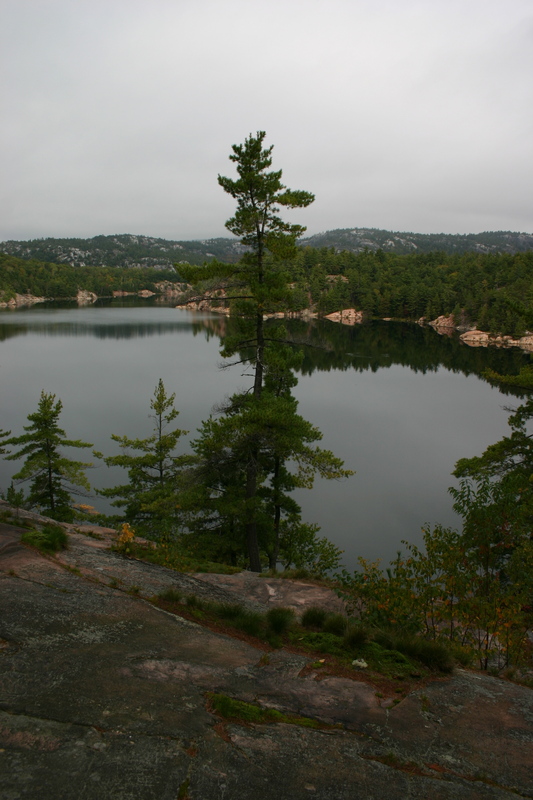 Gave us sweeping views of Georgian Bay and the white La Cloche Mountains. They say these quartzite hills are 2.1 billion years old and the basis of a mountain range that once pushed up higher than the Rockies. They have aged beautifully. That afternoon we got a different view of things. We sailed through the channel into Killarney Bay. The shoreline, rock formations and islands were just as breathtaking. But we were shocked to see one of the big islands decapitated by strip mining. Not what you would expect out here. We also saw large summer estates on the shore. Americans owned them all. You can form your own opinion. On our homeward leg we were booked to sail back to Tobermorey at 3:50 PM. That meant retracing our route and killing a whole day driving and waiting – not getting home until well after 7:00 PM. Our GPS told us we could be home by 3:00 PM if we just followed the shoreline south. We did, going full circle around Georgian Bay and getting back to Southampton well before the ferry even sailed from South Beymouth. The scenery changed after a while. Four-lane highways are like that. But the serenity of where we were stayed with us. It was a six-hour drive. 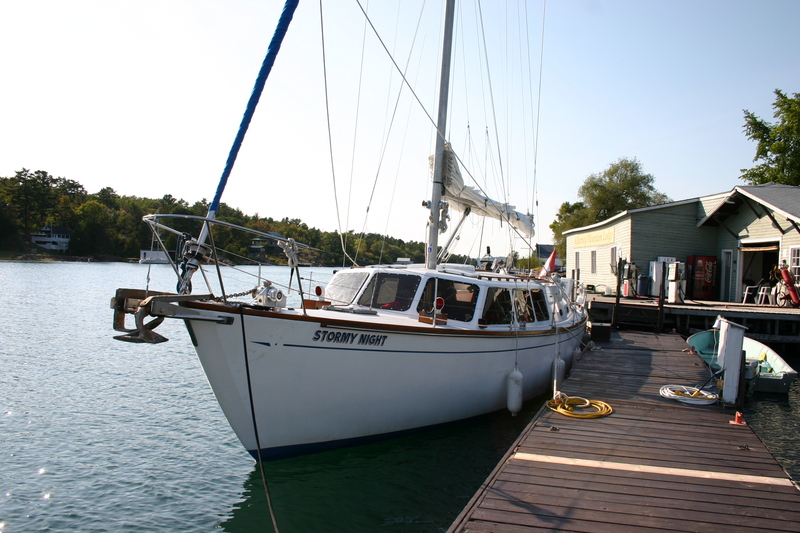 A round trip of 856 km and two hours of sailing later we were home with impressions of Killarney in the fall still on our minds.